The NuWave Mosaic Precision Induction Wok lets you cook delicious stir-fried meals up to 5 times faster than conventional cooking methods. Thanks to the advanced induction technology which safely heats the Wok without any open flames or hot coils, you can enjoy homemade fried rice in as little as 2 minutes. The secret is in the lightweight, yet sturdy carbon steel Wok, which is custom-made specifically for the induction base, ensuring total coverage in the induction base for fast, even heating. 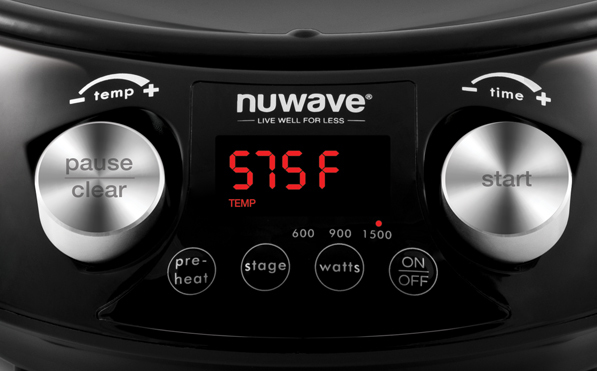 The NuWave Mosaic Precision Induction Wok offers precise temperature control with the simple turn of a dial. With an expansive temperature range, adjustable in 5-degree increments, this portable, powerful Wok can cook as low as 100°F and as high as 575°F. It even offers three convenient wattage settings, so you can cook at 600, 900, or at the full 1500 watts so you can cook with more than one appliance plugged into the same outlet. 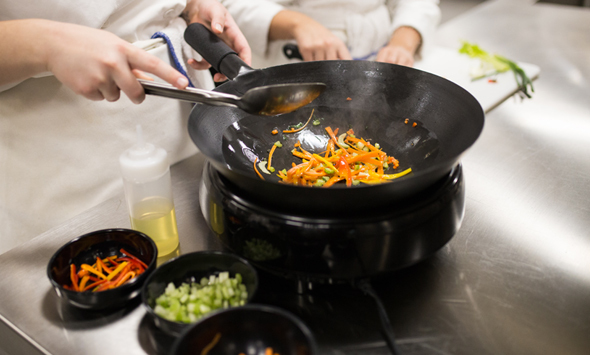 While the Precision Induction Wok is great for making healthy, delicious Asian dishes, it’s not just limited to one type of cuisine. In addition to making perfect stir-fries, you can also use the Wok to sear, sauté, steam and even slow cook. Everything from fajitas to soups to pasta dishes and even scrumptious desserts can be made in this versatile Wok. The Wok even comes with a convenient Deep Frying Rack so you can easily make delicious tempura fried foods. When cooking on a traditional gas or electric stove, you are wasting energy by heating the area around your cookware. The Mosaic Wok base generates heat directly in the Wok itself, wasting virtually no energy while cooking your food. Plus, the Wok itself is custom-made for the Induction Base, ensuring the curvature of the Wok and the base match perfectly. This means that the total surface of the Wok comes in contact with the induction surface, ensuring every part of the Wok heats up quickly and evenly every time. In addition to providing a fast method of cooking, it’s also much safer than other forms of cooking too. Because there’s no open flame, the heat is kept within the wok itself, leaving your countertops cool to the touch. 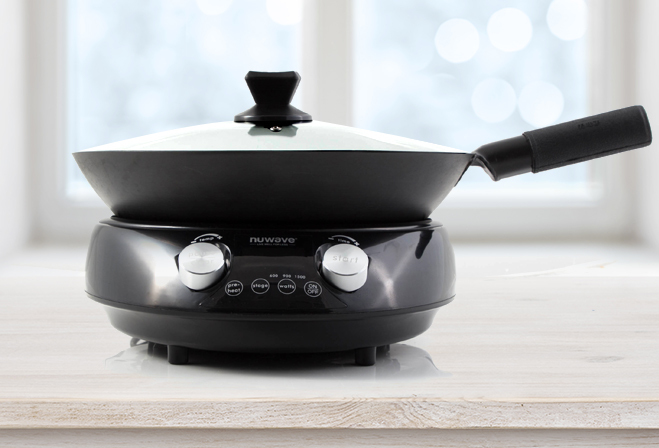 And unlike stovetop woks which can get extremely hot and are prone to being wobbly and unstable, the Induction Wok Base remains cool and stable while you cook. The Mosaic Wok is so easy to use, virtually anyone can cook like a professional chef. The Wok includes two intuitive dials for quick and easy time and temperature adjustments. The Preheat button makes it super easy to bring the Wok to the perfect temperature for cooking delicate foods such as fish or tofu. 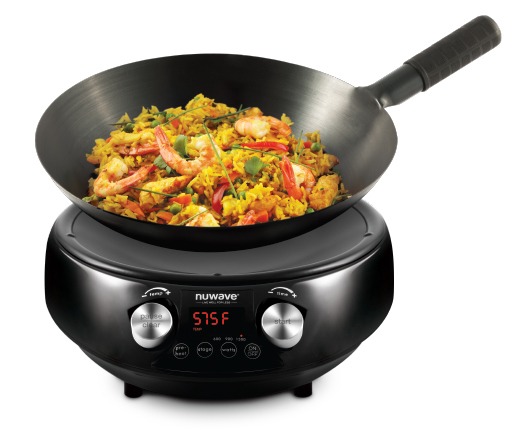 You can even program up to 10 different cooking functions right into the Wok using the Stage Cooking function. Everything is tied together by the bright digital LED display right in the middle of the control panel, ensuring you always know your cooking temperature and how much time is left on your timer. The Wok’s carbon steel material is the perfect marriage of sturdy construction and lightweight design. 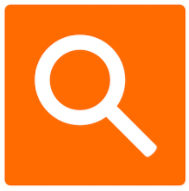 This unique material is the preferred choice for professional chefs because it responds to temperature changes extremely fast. 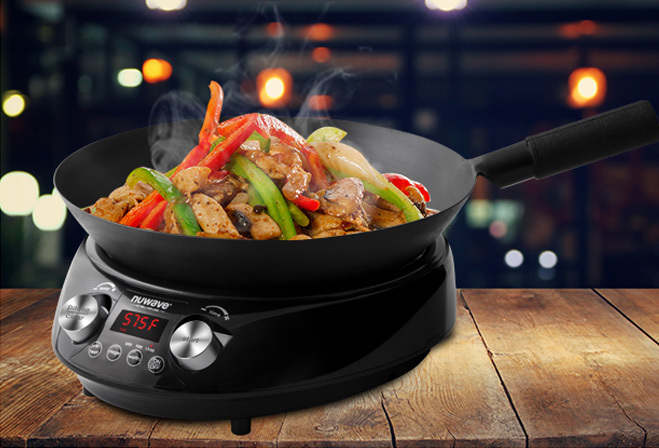 This means that the Wok can reach the perfect stir-frying temperature in less than a minute. The carbon steel has the added benefit of being strong and sturdy while remaining lightweight. 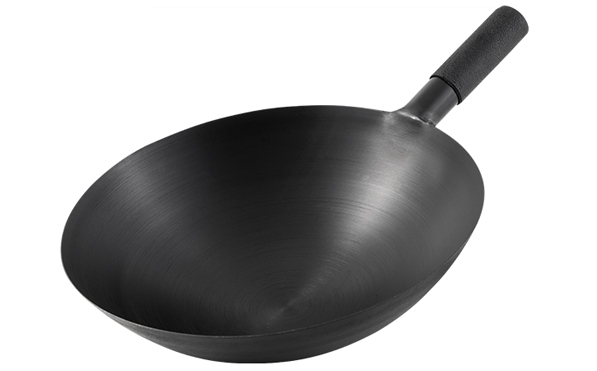 Plus the Wok includes an easy grip silicone handle that remains cool to the touch while cooking. The NuWave Mosaic Wok is truly a time saver. Instead of getting into your car, then driving to the restaurant to pick up your fried rice before finally driving home to eat, you can cook your own fried rice in just 2 minutes. Other dishes like stir-fried vegetables that can take 10 minutes to cook can be made in the Mosaic in as little as 1 minute. Sweet and sour chicken that takes up to 25 minutes to cook can be made in just 5 minutes in the Mosaic. 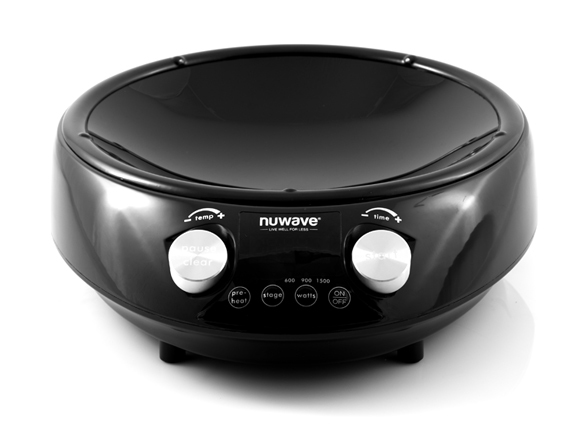 In fact, thanks to the combination of advanced, powerful induction technology and the specially designed carbon steel construction of the Wok, the NuWave Mosaic can cook up to 5 times faster than conventional cooking methods. Everyone has their favorite dish at the local Chinese takeout place, but far too often those places load their food with unhealthy fat, oil and plenty of extra calories. 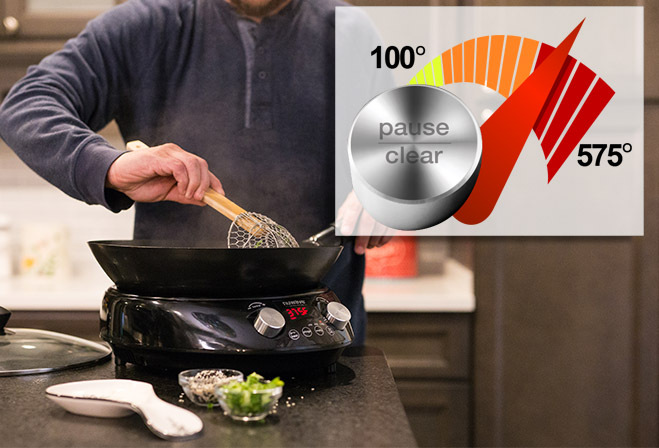 With the Mosaic Induction Wok, you can now enjoy the same great taste you know and love but made healthier because you control exactly what goes into your wok creations. This is especially useful if you have food allergies that prohibit you from eating at some Asian restaurants. Now you can enjoy delicious wok-created food without worrying about potential peanut or gluten contamination. The Mosaic Wok’s 4-quart capacity means you can cook delicious meals the whole family can enjoy all made without dirtying any extra dishes. The Mosaic Wok even comes with a lid to help prevent food splatters on your clean countertops. 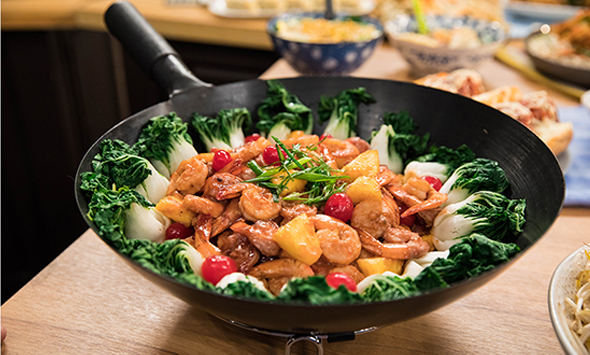 And thanks to the included Wok Stand, your Wok can even double as a handy serving platter, saving you yet another dish to clean. And when it’s time to clean up, simply wipe the Wok clean with a paper towel or a dry rag. No more deep scrubbing or scouring countless pans when you’re cooking with the Mosaic Induction Wok.